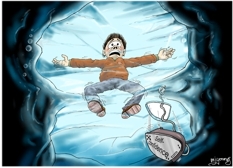 Danger – Thin ice metaphor picture. Close-up of the hot iron falling through the ice. 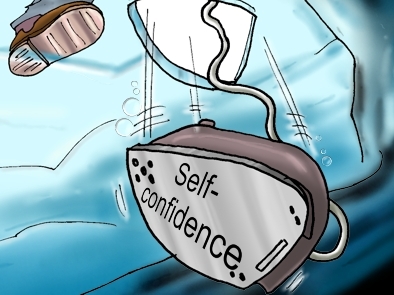 Notice it says “Self-confidence” on the iron. 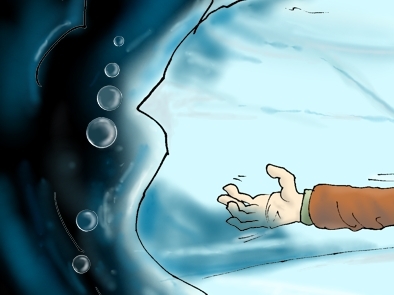 Close-up of the bubbles under the ice – I’ve never drawn them before! As a Christian there is a danger in thinking we are invulnerable to a particular sin, or a particular lie of the enemy (Satan), especially if this is an area of our life or behaviour where we have “fallen” before. I liken it to walking on very thin ice; at any moment we might fall through. We can be so blasé about the dangers, sins, or temptations we face. It is so easy to become conceited; believing that our characters are strong enough to afford us protection from the temptation. We can ignore the danger signs that warn us of impending danger. We can fail to remember how we felt the last time we did wrong in exactly the same place in our life. That definition implies that the more we indulge a thing ( a sinful behaviour), the less effect we think it has on us. But that is not the case. Even if we fail to see the sin-stain on our souls, it is still there. The point of showing a hot iron falling through the ice, is to point out that having confidence in your own abilities (referred to as “Self-confidence” on the iron’s hot surface) is about as useful as putting a hot iron on ice & expecting it to remain on the surface! Fortunately for Christians, Jesus has removed every sin-stain we ever have, in the past, present or future. But that is not a license to indulge sinful behaviour in ourselves. Sermon/teaching theme suggestions: This picture could be used to talk about the dangers we face as Christians, especially when we think we are safe from sin!